En la presente convocatoria no se aceptarán trabajos en los cuales haya discriminación racial, o trabajos que inciten a la violencia, o al maltrato animal. Cada autor podrá inscribir el número de obras que desee. La muestra Intermediaciones no se hace responsable por infracciones de derechos de autor de las obras inscritas; por lo tanto, cualquier tipo de reclamo legal recaerá en los titulares de la obra. Cierre de inscripciones: Julio 30 de 2018. Los titulares de las obras seleccionadas deberán enviar a través de MyairBridge, Wetransfer, u otra plataforma, copia de la obra; también lo pueden hacer en DVD, en este caso nos deben escribir un mensaje con la solicitud de la dirección física. Los trabajos seleccionados pasarán a formar parte del archivo de la Muestra Intermediaciones, y podrán ser presentados en diversos eventos itinerantes de la muestra en otras ciudades y países. Con la inscripción, el autor de la obra cede a la muestra Intermediaciones los derechos de reproducción y exhibición para la proyección del video en la muestra Intermediaciones, así como autoriza su proyección en eventos itinerantes de Intermediaciones en otras ciudades y países. El autor autoriza a la muestra Intermediaciones utilizar imágenes de su trabajo para actividades promocionales y de divulgación, tales como: catálogos, reels promocionales, folletos, entre otras actividades para la promoción y difusión de la Muestra Intermediaciones. Cinema Workshop Project, Magic Eye Audiovisual Production Company and Wild Wood Corporation invite artists, visual artists, filmmakers, professionals, students and amateurs, to present their work in Intermediations, a Video Art and Experimental Video Showcase. The Showcase will take place in the City of Medellin, Colombia. It is a non-competitive event, that seeks to promote and divulge different practices surrounding audiovisual works, specifically, artistic and experimental video. Entries will be exhibited in three categories: Local, National and International exhibitions. We invite creators from around the world to submit works produced between 2016 and 2018. Works with dialogue and/or text in a language other than Spanish should include Spanish subtitles. Works including racial discrimination, works that incite violence, as well as works portraying animal abuse will not be accepted. Only entries including the registration form and a signed projection release will be considered. There are no limits to the number of work submissions by each author or participant(s). Intermediations showcase is not responsible for any copyright infringement incurred by the authors of the works submitted; any legal claim will fall and be responded by the owners and/or creators of the work. The works submitted for selection they will become part of the archive of Intermediations Video Art and Experimental Video Showcase. They will be made available for screenings, events, and media promotion organized by Intermediations for cultural purposes. The Filmmaker´s and producers will give in the rights without any charge during the Video Art and Experimental Video Showcase, and for cultural programs, provided Intermediations. 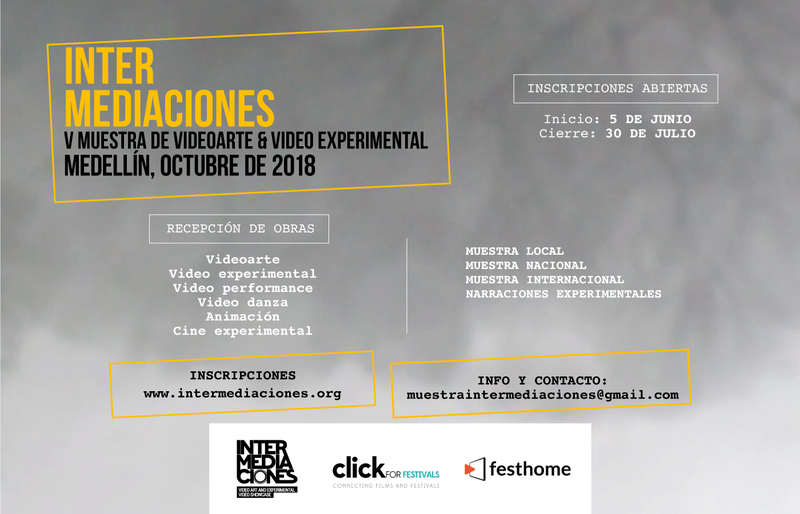 After the Video Art and Experimental Video Showcase, Intermediations may use selected productions for cultural and environmental programs, provided that the entry is free, informing the directors or producers or distributors of the place and date.